Last week, I featured several Phoenix and Scottsdale restaurants. Here’s part two of that series. A visit to these parts wouldn’t be complete without a proper smokehouse experience. Since November 2013, Bootleggers Modern American Smokehouse offers meat lovers an amazing, right-from-the-smoker experience in the heart of Old Town. Moonshine is made on the premises (I tried their apple pie moonshine. Tasty way to end a meal!). The restaurant’s award-winning burger is on the lunch menu but as we were there for dinner, my aim was to try their bacon board and BBQ sampler. Luckily I had company to share it all with! The Bacon Board you see here is actually a half order as I wanted to save room for the St. Louis ribs, 14-hour hickory-smoked beef brisket, organic smoked turkey breast, pulled pork and hot links. 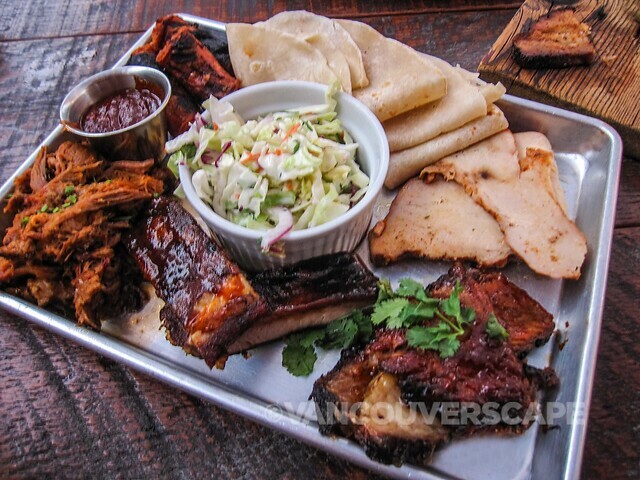 The BBQ sampler comes in two sizes: for two ($32) or four ($60). On the board are handmade tortillas and cole slaw. 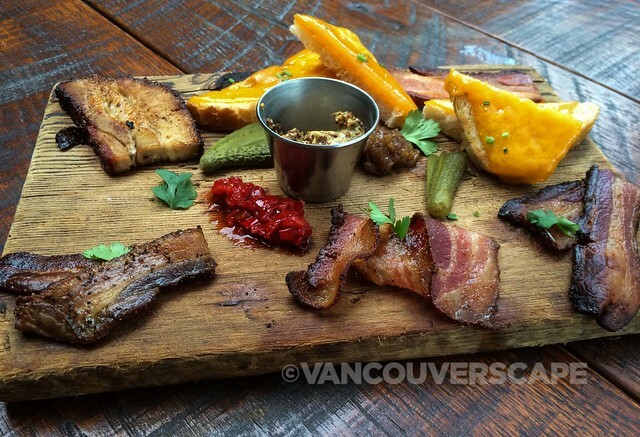 Back to the bacon board: five types of rotating bacon served up with onion jam, grainy mustard, house-brined pickles and cheesy bread. We also ordered smoked sweet corn with cholula-lime butter ($6) and a trio of smoked salmon tacos on more of those yummy, warm tortillas. 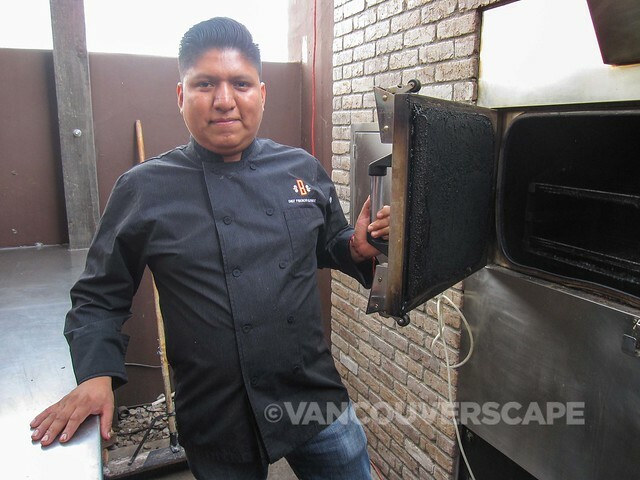 I also had the chance to meet Chef Fidencio Alatriste, who opened up an already emptied smoker out on the back patio. Chef Fidencio started as a sous chef here. Co-owners Rick Philipps and Kevin Slade both have food backgrounds (Rick runs Eater Arizona together with a partner; Kevin’s a BBQ pit master). Craft beer lovers will be pleased with the restaurant’s 20 beer taps, many from local breweries such as Four Peaks, Papago, and San Tan. Cocktails galore, moonshine, white and red wines, and cold canned beers are also available. 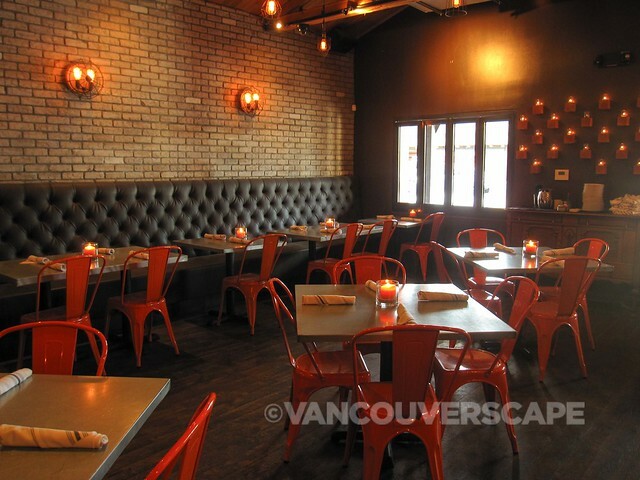 Although we dined on the back patio, the interior is fun, with mason jar chandeliers, vintage Edison lightbulbs, colourful seating, candles on the walls, high wood beam ceilings and rustic touches throughout. 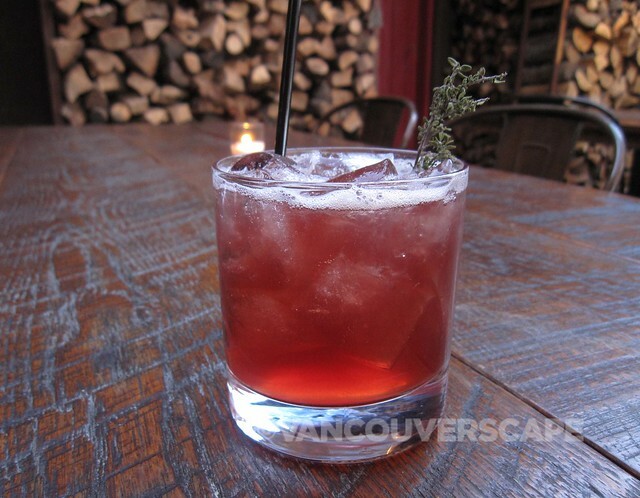 Featured on the Travel Channel’s Food Paradise Show, Bootleggers is a must-dine spot when in town. If you’re not into meat, there’s several vegetarian dishes to order as well. 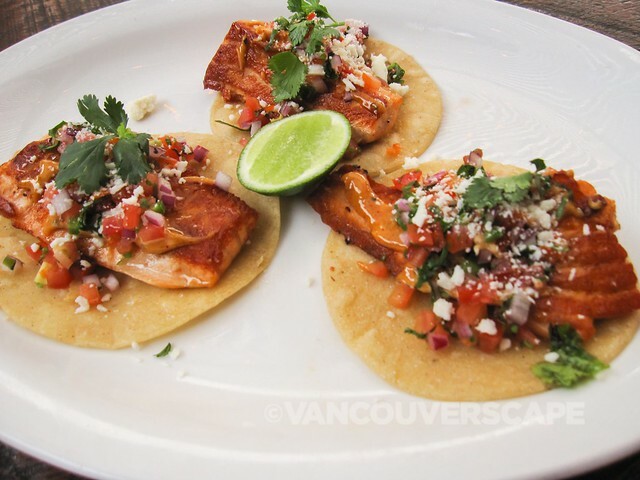 I did mention those smoked salmon tacos, right? 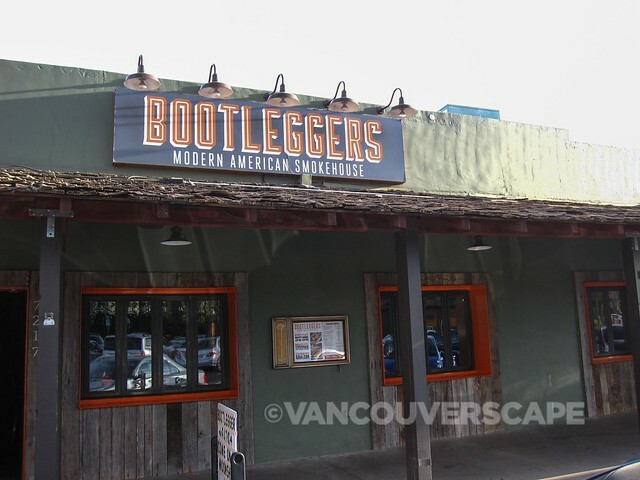 Find Bootleggers Modern American Smokehouse at 7217 East 1st Street in Scottsdale, Arizona. Another great way to get a taste of Scottsdale’s numerous dining options is with a food tour. A Taste of Old Town Scottsdale rates highly on TripAdvisor as one of the top things to do while in town. Our guide Jason let us know right off the bat that Scottsdale has more restaurants per capita than Manhattan! I can imagine the challenge of picking just six, but on a sunny Saturday morning, our group of 16 met in front of the Scottsdale Historical Museum for a three-hour lunch walking tour ($54), complete with local history, dining tips, and lots of conversation about food. Jason’s a dietitian who enjoys showcasing Scottsdale’s foodie scene to travellers. Old Town is steeped in history. In 1888, American Baptist minister, military officer, and politician Winfield Scott, following a visit to Salt River Valley, purchased 640 acres here at $2.40 an acre, naming the city Orangedale due to the abundance of citrus trees. Scott was the first person to grow peanuts, grapes and, citrus trees, advocating the area’s potential as a major agricultural area as well as a health resort. Families began to move in near Scott’s ranch; in 1896, a school was added, and the settlement around his ranch was officially named Scottsdale. Our tour brought us to Rusty Spur, The Mission, Outrageous Olive Oils, Grimaldi’s Brick-Oven Pizza, Cowboy Ciao and 5th and Wine. We had a decent amount of time at each place to enjoy the food samples, learn a bit about the restaurants (and in one case, olive oil shop) and take in the atmosphere before moving to the next stop. I liked the variety of spots chosen. 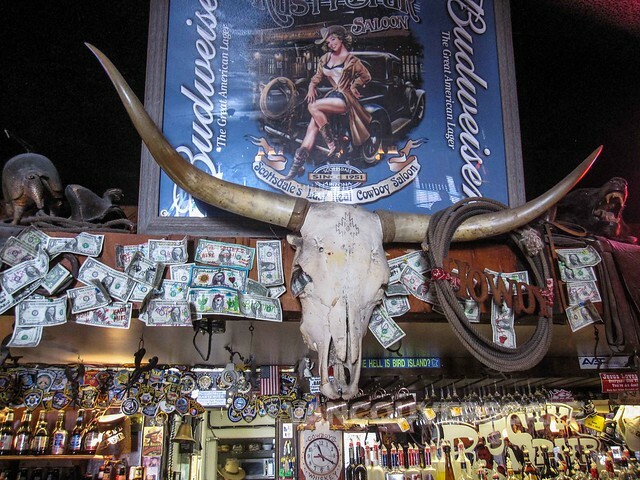 Rusty Spur Saloon is housed in a building that formally served as Scottsdale’s first bank (from 1921 to 1931) and happens to be the town’s oldest saloon where you can still enjoy live cowboy music. 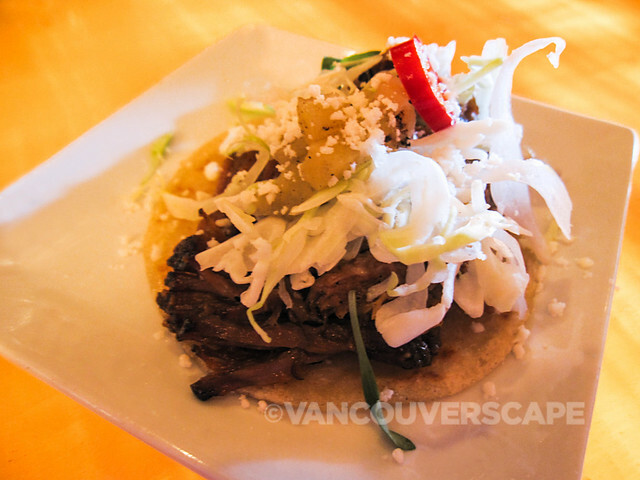 At The Mission, the influence is on Spanish, Central and South American cuisine, prepared by Executive Chef Matt Carter. The House Brasserie and Zinc Bistro are also part of the Carter dining trifecta in Scottsdale. Outrageous Olive Oils & Vinegars is filled with gourmet products and worth a visit when in town. The shop’s 18 Year Traditional balsamic is their number one seller. Grimaldi’s Coal-Brick Oven Pizzeria uses coal rather than wood to fire their pizzas, the biggest difference being temperature and consistency. Grimaldi’s coal comes in from Philadelphia and is considered some of the cleanest-burning coal in the country. We sampled slices of pepperoni and cheese thin-crust pizzas, relaxed and keeping cool on the covered patio during the hottest part of the day. 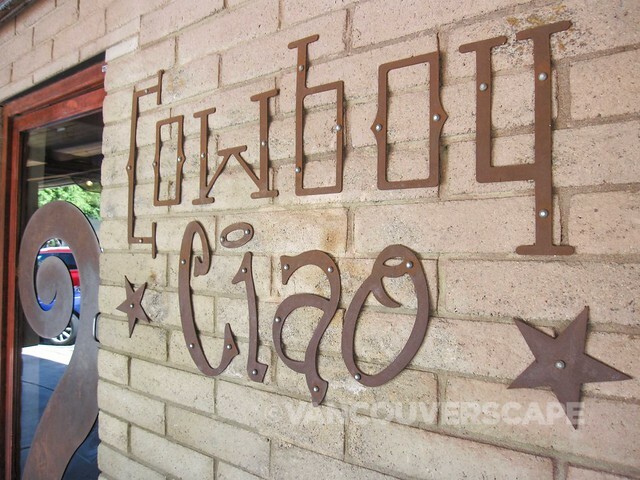 Cowboy Ciao is a fun spot with a global influence. Modern American Food with a twist is how I’d describe it. They’ve also a bakery next door for yummy cookies and baked goods, Super Chunk, and have recently opened at Sky Harbour Airport, so if you miss a chance to dine in town, you can get a meal before your flight. I missed the final stop, 5th and Wine, due to another appointment; because our group was at maximum, we were running about a half hour late, so it’s a good idea to keep some padding between the food tour and your next adventure just in case. In addition to the lunch tours, there’s several dinner tours ($74) and a new Sip ’n’ Sample Tour ($62) that combines food with drink pairings. Open since fall 2014, Mesa’s newest spot (and first brewpub!) 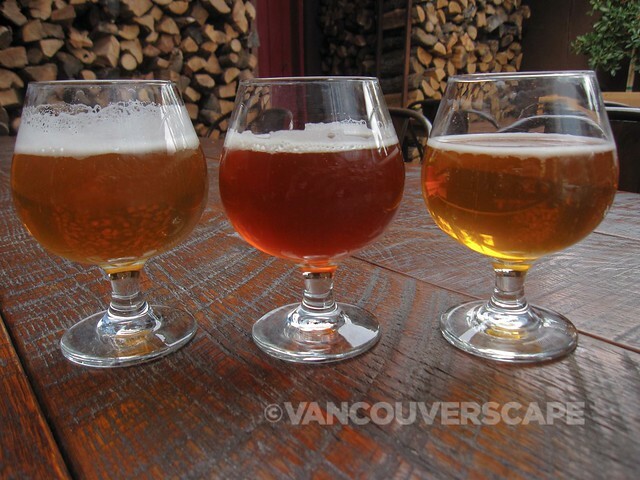 for enjoying craft beer is the Beer Research Institute. B.R.I. features Belgian-style ales with a more fruity flavorful taste and West Coast American style which tend to be hop forward and aggressive. Although we stopped in for craft beer, B.R.I. offers a full menu including appetizers, sandwiches, salads, soups, burgers and some amazing-sounding desserts (a vanilla porter brownie with vanilla bean ice cream and chocolate ganache caught my eye). The beers stay in rotation for about a month depending on demand, and this spot has received more traffic via word of mouth than anything else. In addition to eight of B.R.I.’s own brews, there’s eight guest taps. I much enjoyed the 480G IPA and loved the Street Cred Black IPA, imparting a nice roasted flavour. Beer Research Institute is located at 1641 South Stapley Drive #104 in Mesa, Arizona. I was invited to dine at the above restaurants through Visit Phoenix and Scottsdale Convention and Visitors Bureau as part of a press trip. Opinions, as always, are my own.